On June 6, 2018, President Xi Jinping held talks with President Sooronbay Jeenbekov of Kyrgyzstan at the Great Hall of the People. The two heads of state jointly agreed to establish China-Kyrgyzstan comprehensive strategic partnership, opening a new chapter of friendly cooperation between the two countries. Xi Jinping welcomed Sooronbay Jeenbekov's state visit to China and his attendance at the Shanghai Cooperation Organization (SCO) Qingdao Summit. Xi Jinping stressed that it is another major event with milestone significance in the history of bilateral relations that China and Kyrgyzstan establish the comprehensive strategic partnership, which will inject new impetus into the development of bilateral relations. Standing at a new historical starting point, China is willing to work with Kyrgyzstan to carry forward the spirit of everlasting friendship between the two countries and commit to developing all-round friendly cooperation, so as to jointly strive for achieving development and revitalization and to better benefit the two peoples. Xi Jinping pointed out that Kyrgyzstan was one of the first countries to support and participate in the "Belt and Road" construction. China is willing to work with Kyrgyzstan to broaden minds and explore potentials to promote bilateral cooperation to continuously reach new stages. Both sides should enhance alignment of development strategies and policy coordination, seek more converging interests and growth points, and jointly well plan key areas and projects of bilateral cooperation. The two countries should expand economic and trade investment and speed up promotion of cooperation in major projects; both sides should expand people-to-people and cultural as well as local cooperation to enhance good-neighborliness and friendliness; and both sides should improve the level of security cooperation to fight against the "three forces" and transnational organized crime. 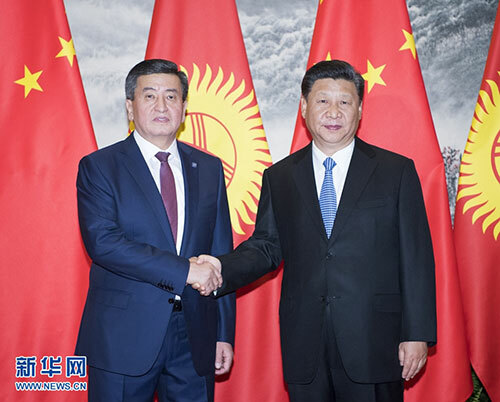 Speaking highly of Kyrgyzstan's strong support for the work undertaken by China as presidency of the SCO, Xi Jinping expressed that China stands ready to make concerted efforts with Kyrgyzstan to promote the forward-looking development of the SCO along a healthy and stable track. Sooronbay Jeenbekov expressed that Kyrgyzstan admires China's achievements in economic and social development and appreciates China's valuable assistance for a long time. The establishment of the comprehensive strategic partnership between Kyrgyzstan and China today unveils a new chapter in bilateral relations. Kyrgyzstan gives priority to its relations with China, and has been and will continue to be the most reliable neighbor, partner, and friend of China. Kyrgyzstan will firmly adhere to the one-China policy, and stands ready to, together with China, strengthen practical cooperation in such areas as economy and trade and people-to-people and cultural engagement, and join forces to combat the "three forces", so as to jointly safeguard peace, stability and security in this region. Kyrgyzstan backs the great Belt and Road Initiative and believes the Initiative will be certain to vigorously promote the common development of the region. Kyrgyzstan will maintain the continuity of all cooperation agreements between the two countries. Kyrgyzstan firmly believes that the SCO Qingdao Summit will surely be a complete success under the leadership of China. After the talks, the two heads of state jointly signed the Joint Statement of the Establishment of the Comprehensive Strategic Partnership Between the People's Republic of China and the Republic of Kyrgyzstan, and witnessed the signing of various cooperation documents between the two sides. Prior to the talks, Xi Jinping held a welcoming ceremony for Sooronbay Jeenbekov at the square outside the East Gate of the Great Hall of the People. This is the first time to use the newly-reformed state visit welcoming ceremony. The welcoming ceremony becomes more solemn, ceremonious and grand after the reform, revealing a new visage and new atmosphere of major-country diplomacy with Chinese characteristics in the new era. Ding Xuexiang, Yang Jiechi, Hao Mingjin, Wang Yi, Zhang Qingli, He Lifeng and others were present.